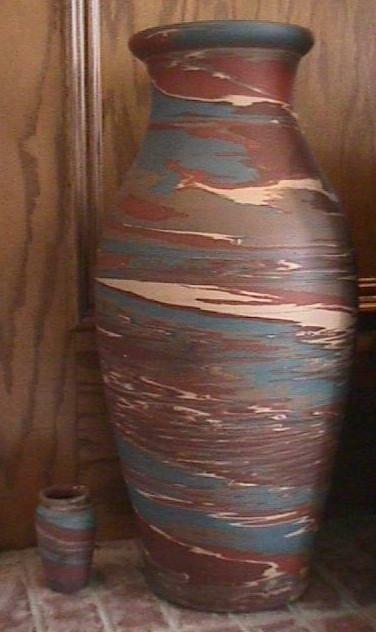 LeCamark This uses a luster technique that John Lessell developed while working at Weller (LaSa). 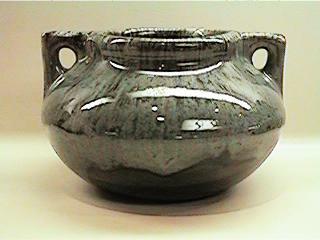 Camark "Coraline" This uses a technique that John Lessell developed while working at Owens China (Swatiska Keramos). 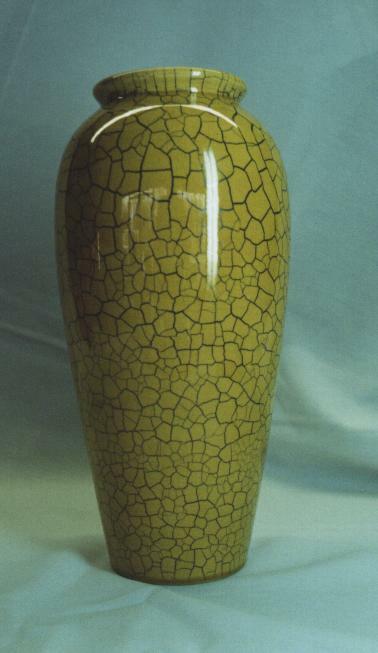 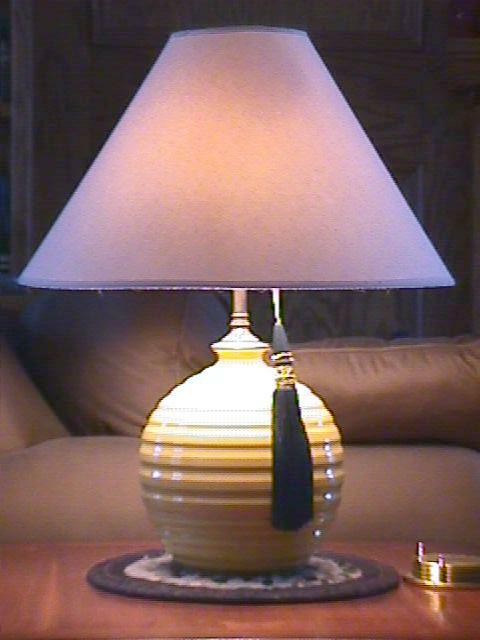 One of my best pieces Yellow Crackle Bright large hand-thrown piece by Frank Long with a Crackle design attributed to Alfred Tetzschner similar to Weller's Cloudburst. 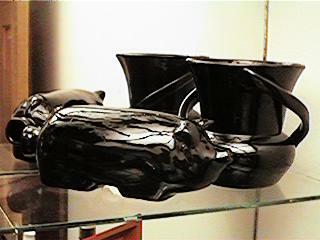 Camark Modernistic The Camark Modernistic line developed by Alfred Tetzschner was introduced a year before Roseville's Futura line. 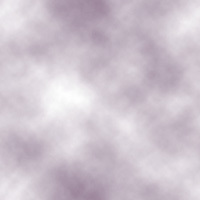 The crackle effect is similar to Weller's Cloudburst. 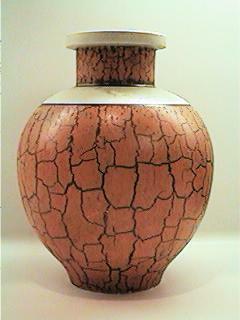 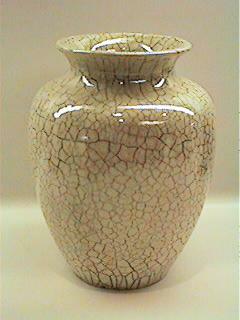 Crackle Vase A purchase from Tony & Rex. 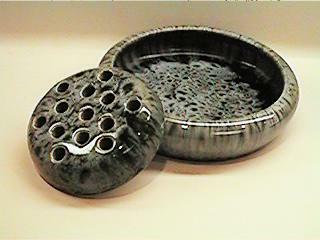 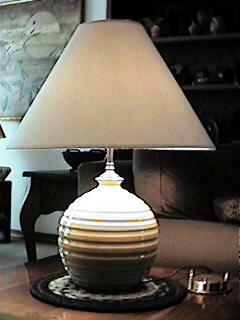 This is Camark crackle effect bowl that is similar to Wellers Cloudburst. 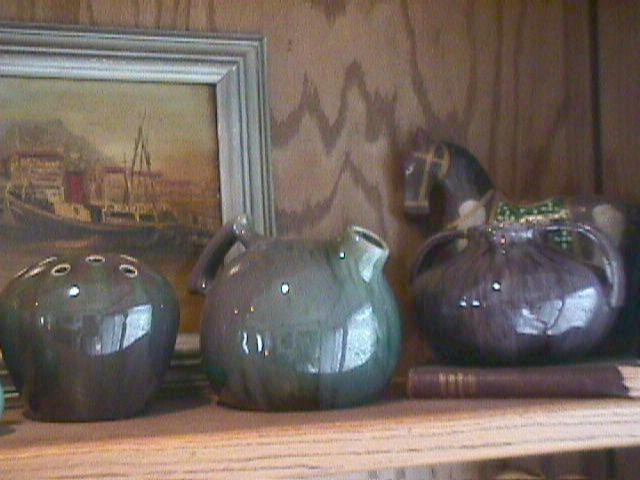 Lessell Designed Pieces These glazes were all designed by John Lessell. 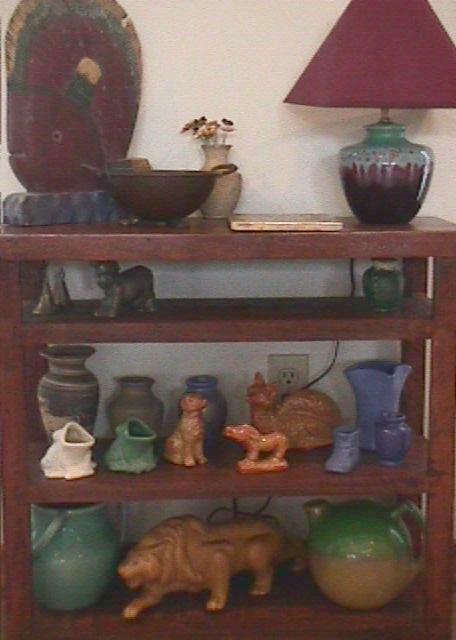 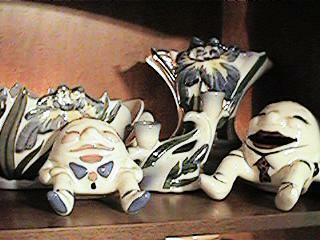 The little green coraline on the left is a piece that he did for Newark Art China on a Fraunfelter blank. 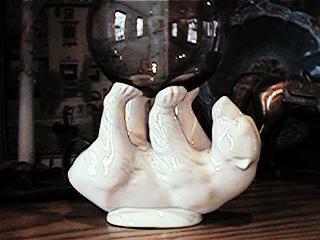 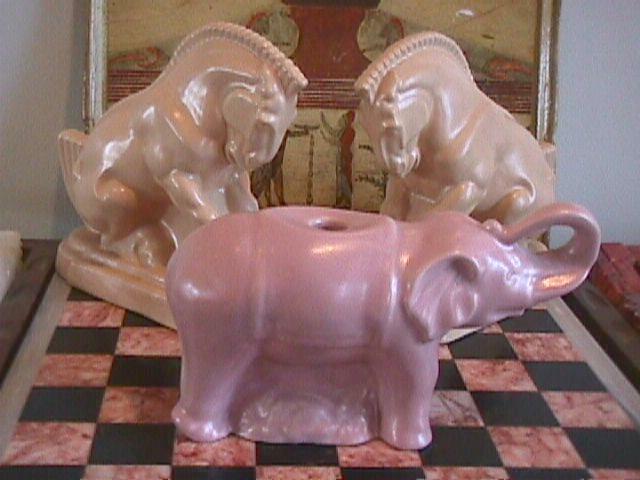 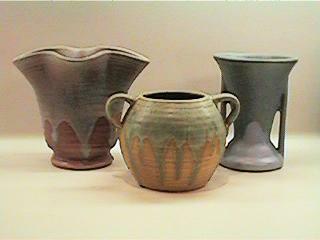 The three in the middle are Camark. 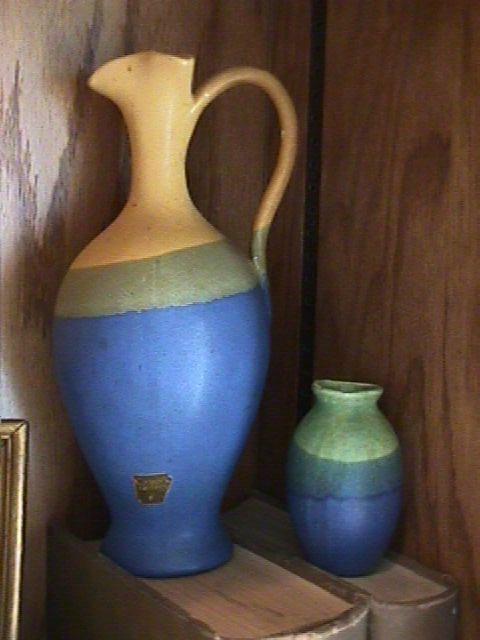 The one on the right is Weller LaSa. 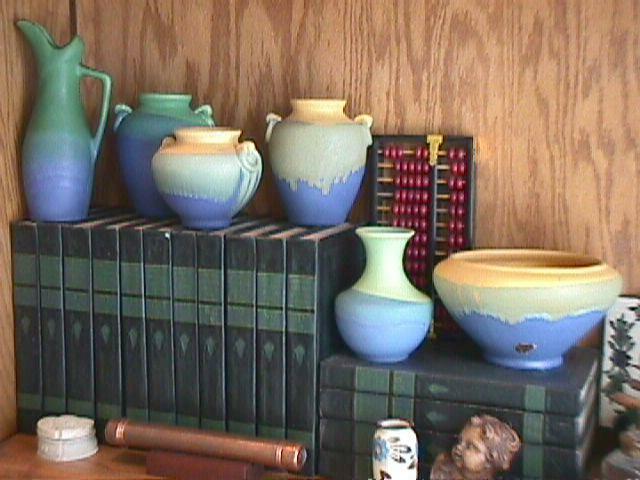 Green/Blue & Yellow/Blue Camark These multi-colored pieces were mis-identified in the Collectors Encyclopedia of Weller Pottery and given the nickname of Dynasty*. 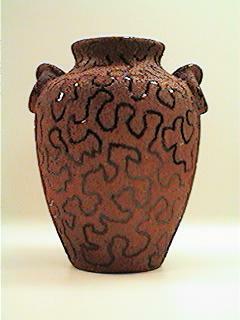 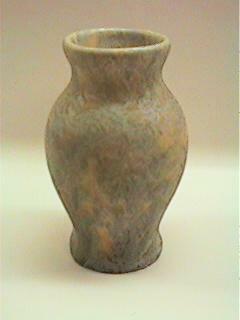 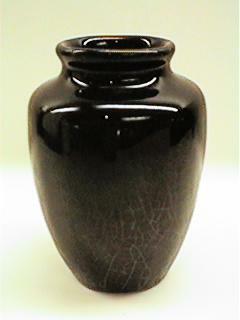 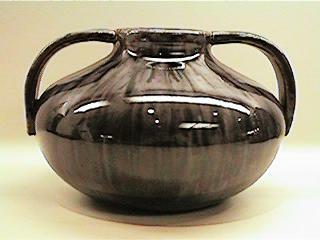 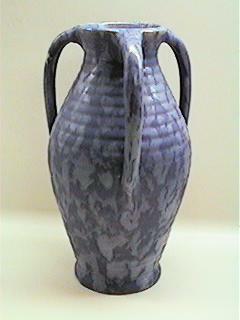 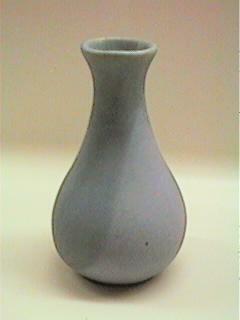 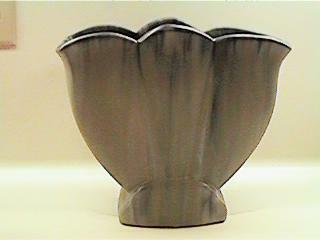 Camark Brown Stipple A marblized technique similar to many potteries. 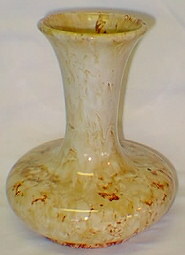 Here is another picture of the large marblized piece. 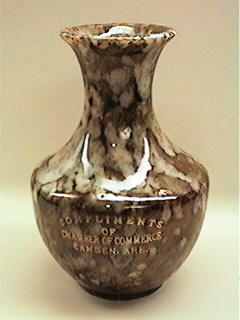 I think Camark did this drip better than anybody. 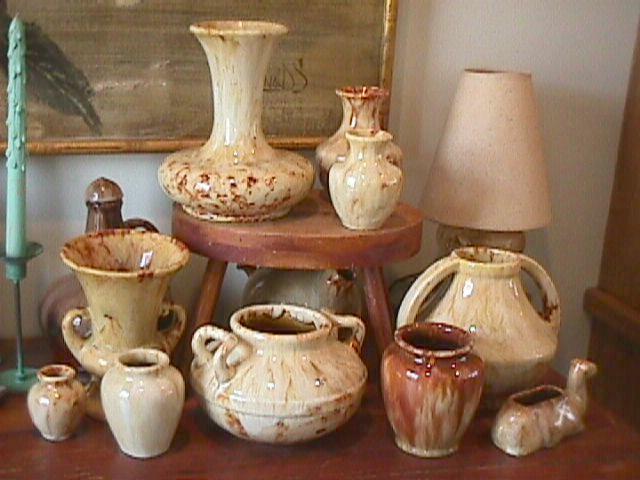 Some pieces actually look like stone. 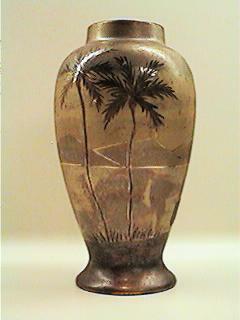 Brown Stipple Pot A 1997 x-mas present from Mom. 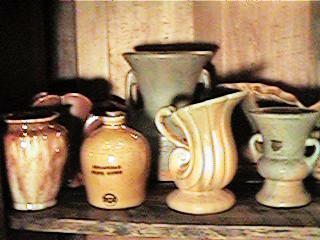 Drip Pieces These are very similar to Muncie. 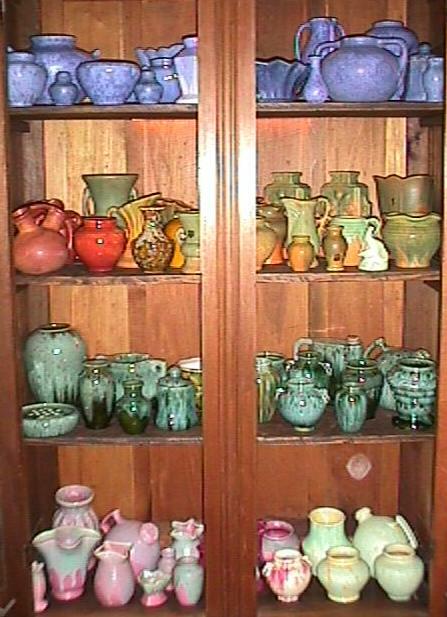 Rose Green Overflow, Orange Green Overflow, & Blue Green Overflow. 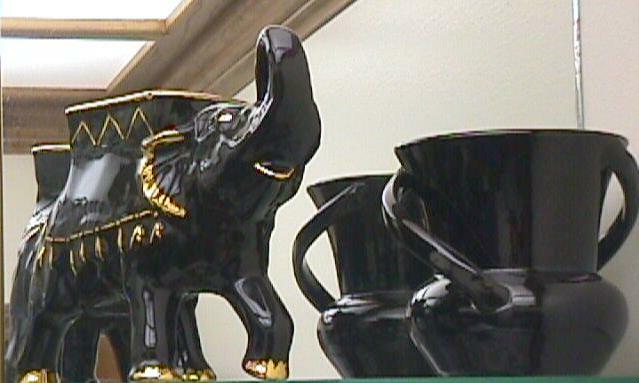 These are probably attributable to Boris Trifonoff a former Muncie employee. 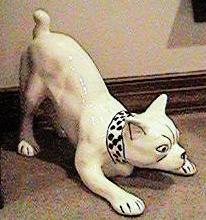 The Large Dog This is one of the later large animals produced by Camark and a difficult item to find. 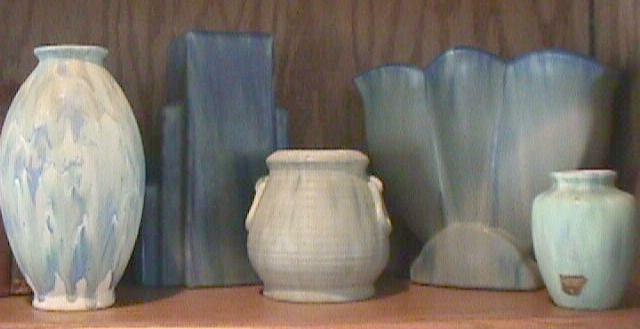 Swirl Pieces The swirl pieces are similar to the painted swirl produced by Nemadji, Baur, Pfaltzgraf, and others. 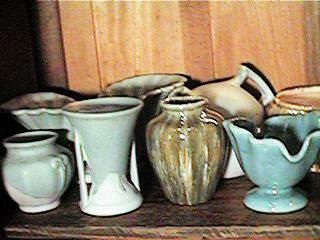 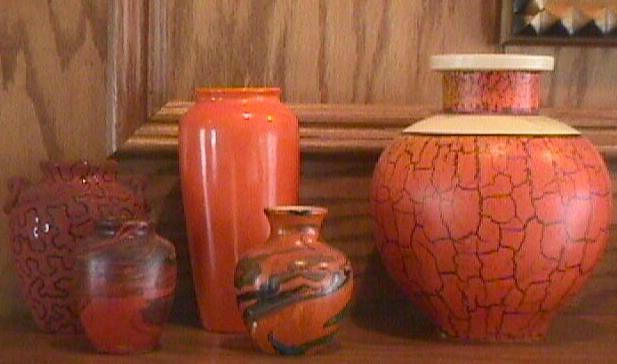 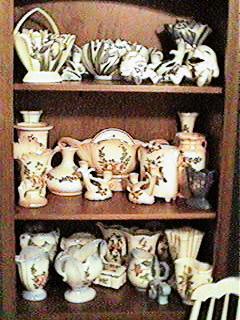 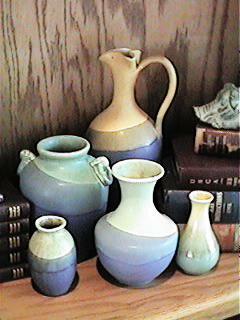 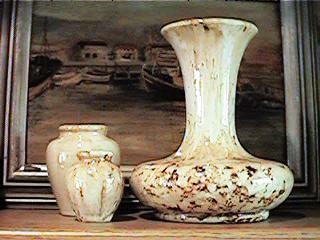 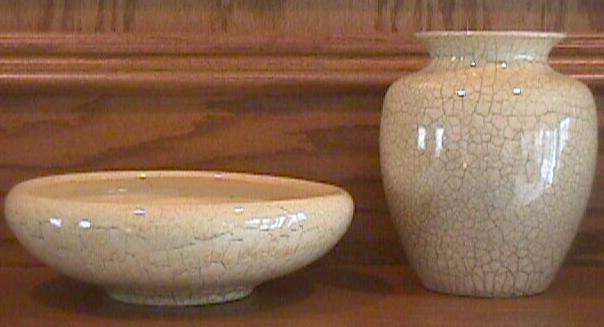 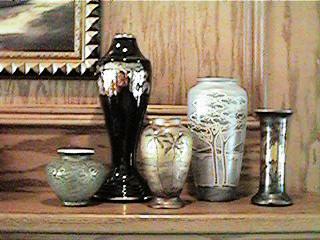 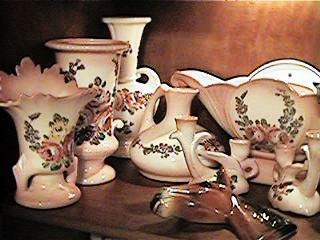 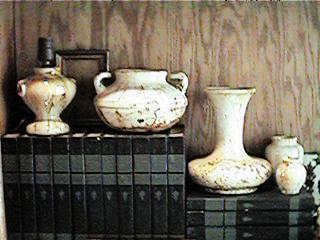 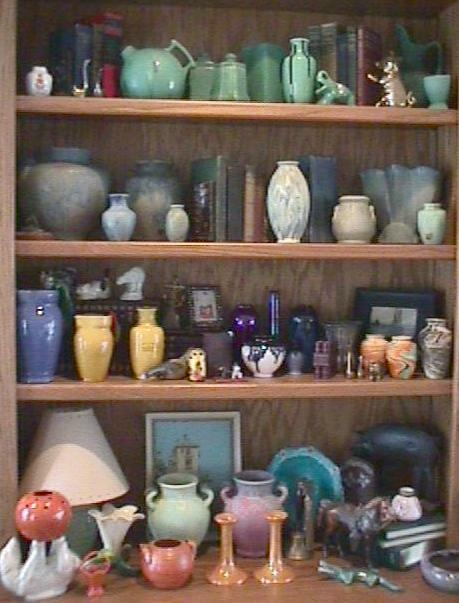 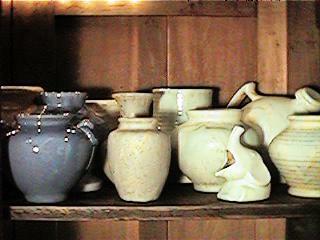 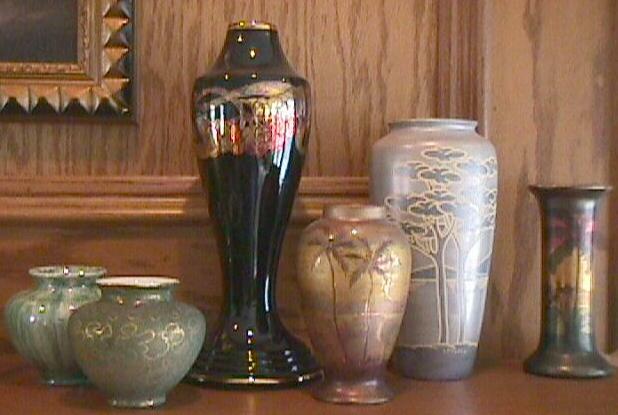 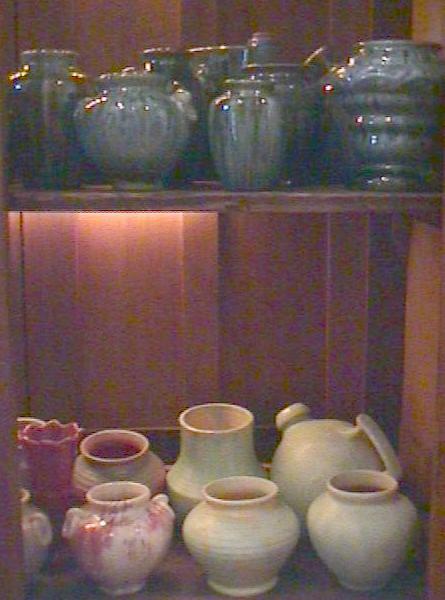 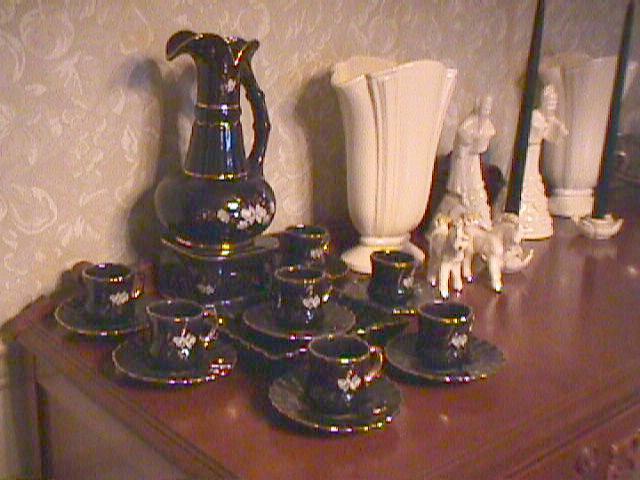 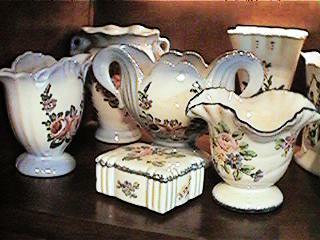 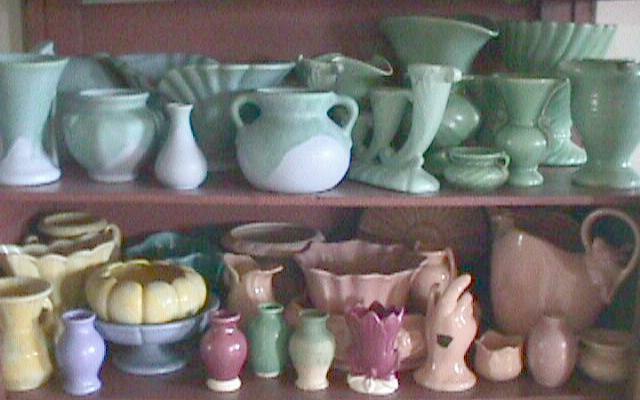 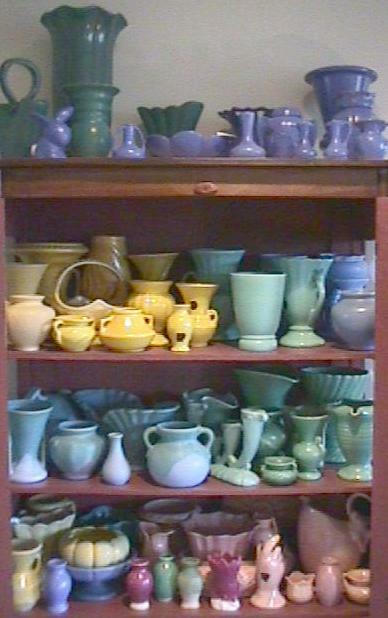 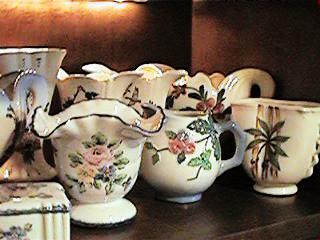 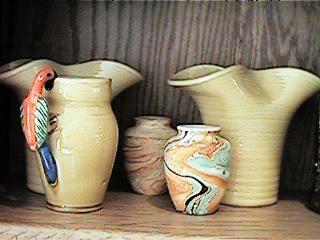 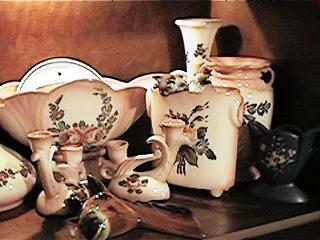 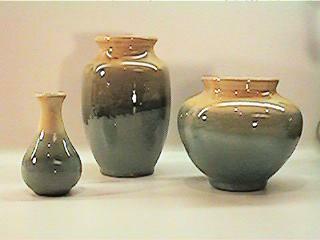 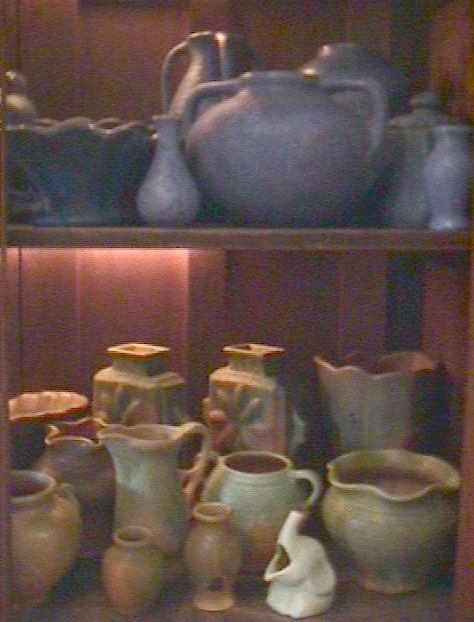 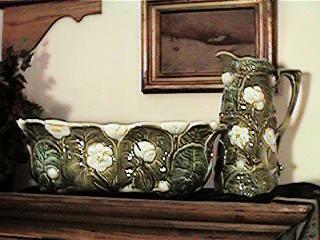 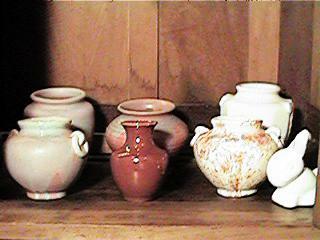 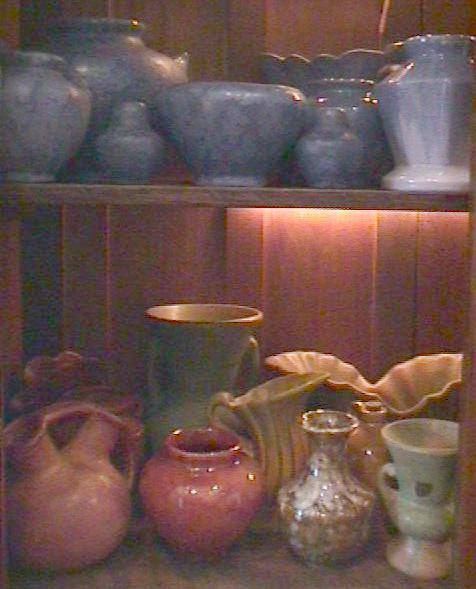 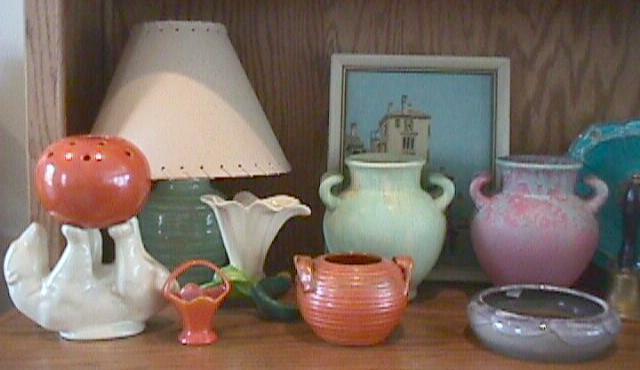 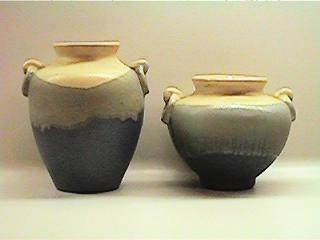 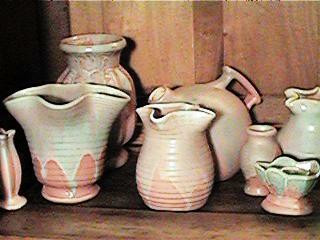 The parrot pitcher on the far left is similar to many produced in Italy. 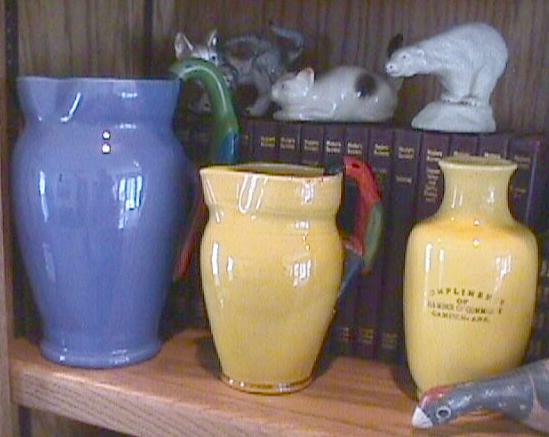 The ringed piece on the far right is a Camark SpanoWare piece that is a high gloss, non-hand decorated version of the Weller Barcelona line. 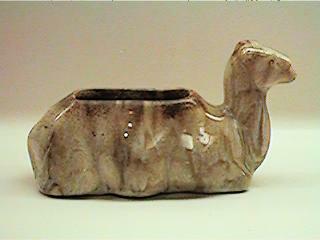 An early frog ashtray This is one of the few animals produced in the early part of Camark's production - pre-1935 or so. 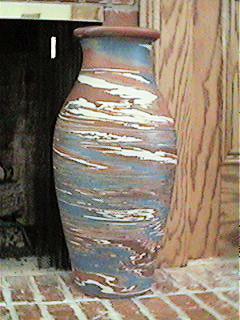 I purchased this on the Internet from the Noisy Boy & Disorderly Girl. 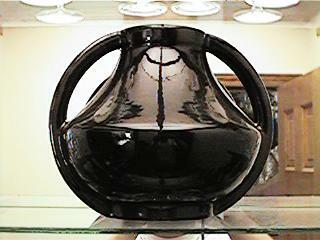 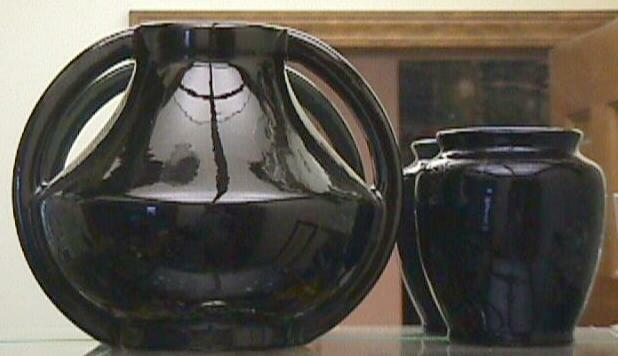 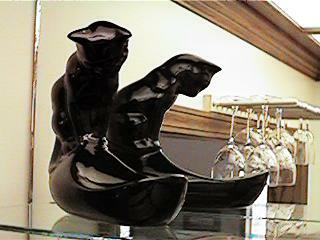 Large Mirror Black Piece This is the same shape as a piece of Coors Pottery & Rum Rill. 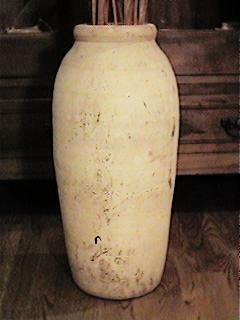 Large White Piece This shape was done in three sizes. 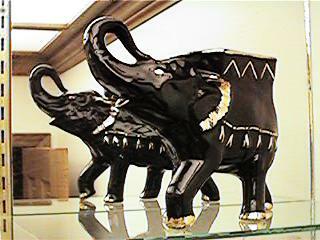 This is the largest. 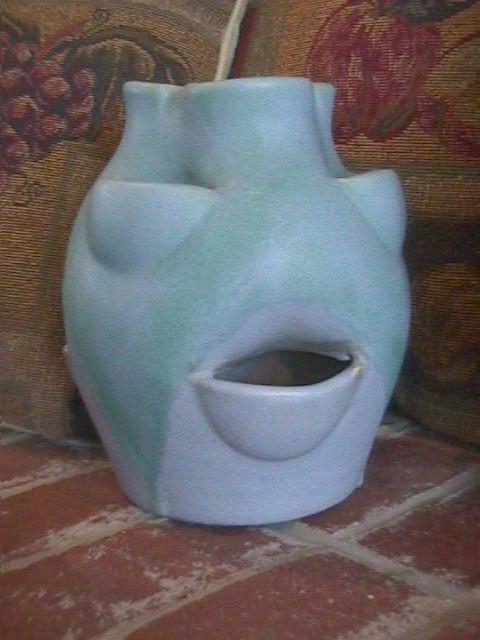 I purchased this from Molly & Randy. 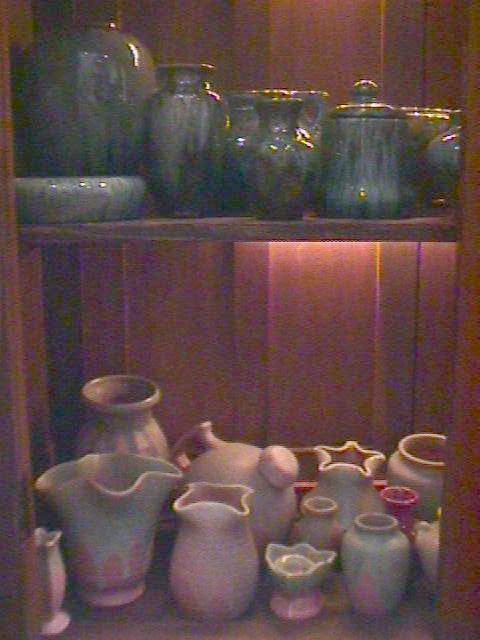 Hand Decorated Pieces Many of the people that live in Arkansas think of the hand decorated pieces and their pastel cousins when they think of Camark pottery. 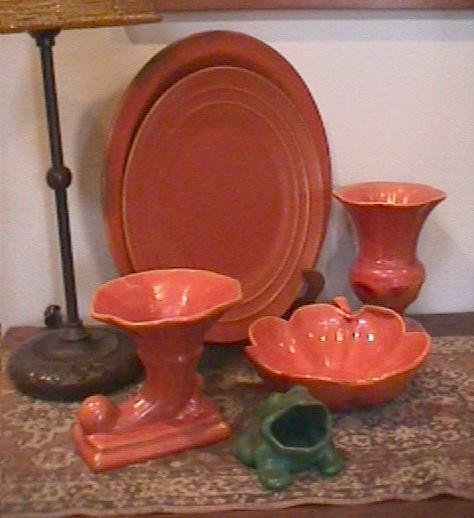 Camark acted as a wholesaler from the mid-1920's to the mid-1930's and did not distribute retail merchandise in state until after the mid-1930's. 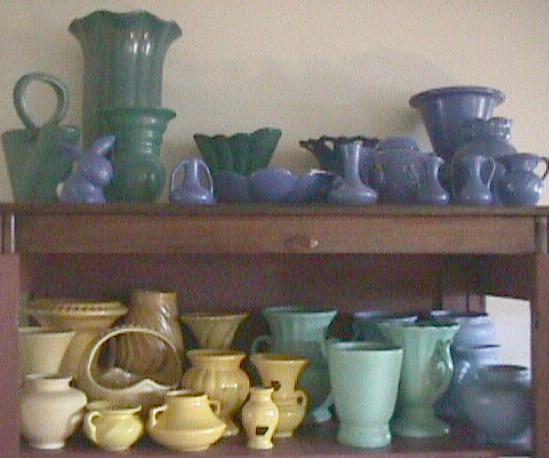 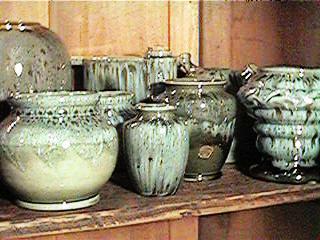 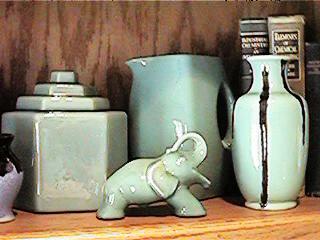 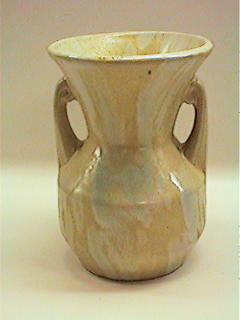 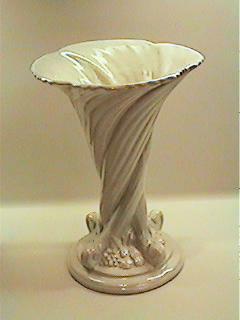 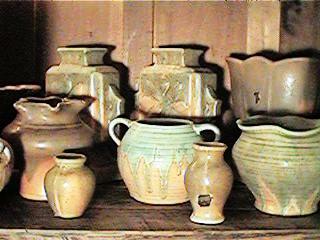 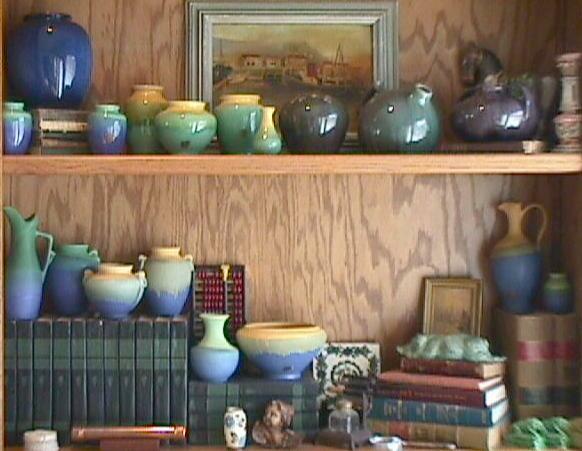 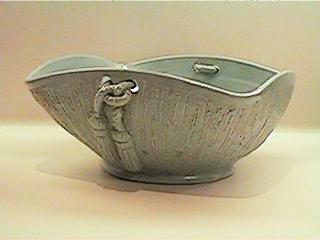 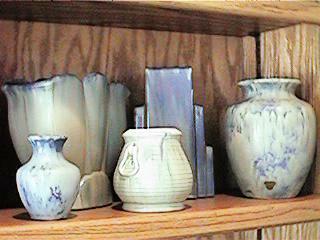 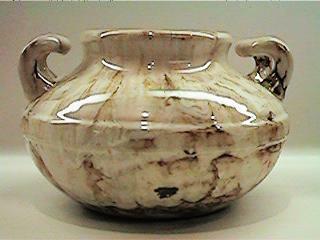 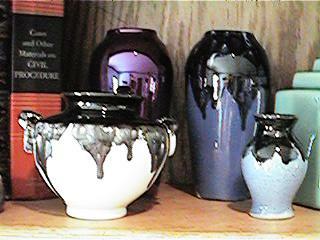 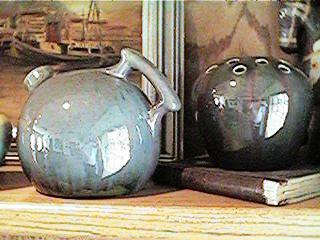 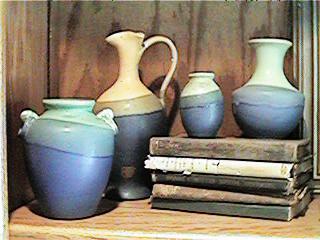 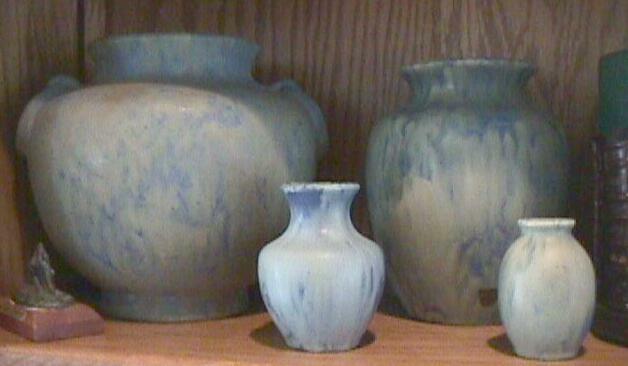 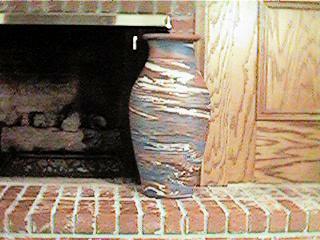 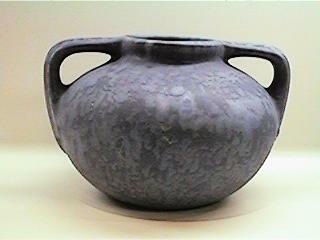 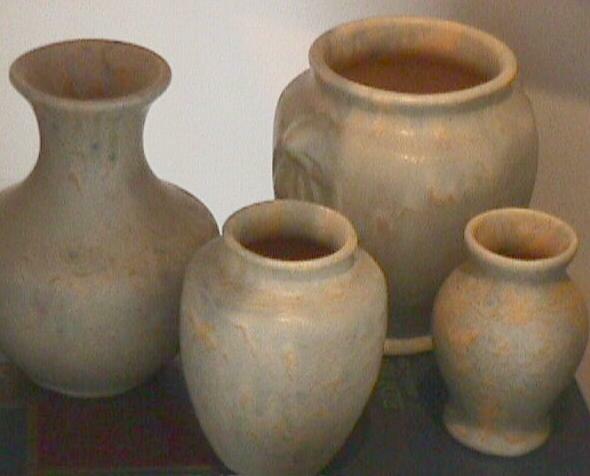 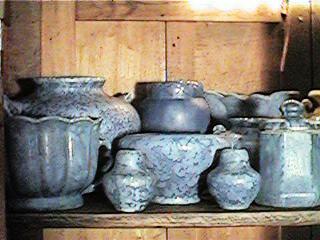 Therefore, most Arkansans are not as familiar with the pre-1935 pottery. 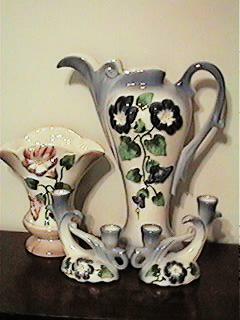 Their association is with the pieces that they grew up knowing, which would be similar to these. 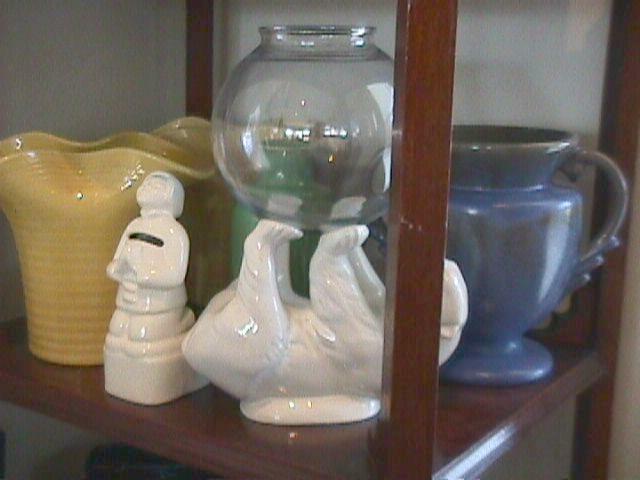 The Humpty Dumpty pieces are a hard item to find. 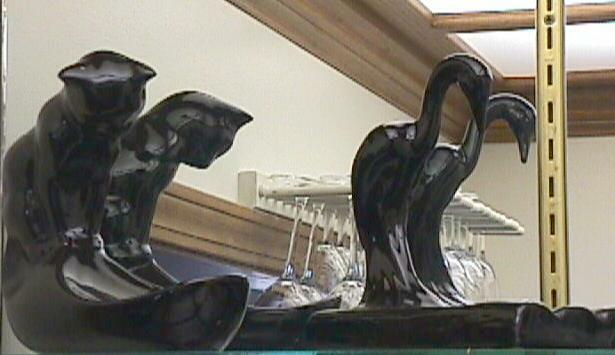 They are designed to sit on a windowsill. 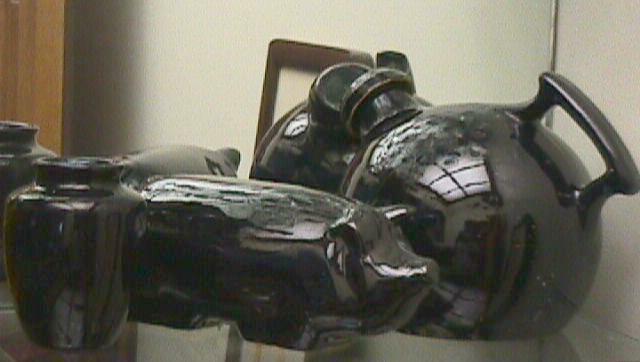 When I do find these, the legs are often broken. 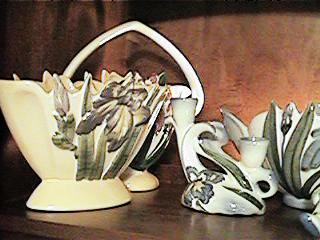 The purple Iris with the yellow trim is a difficult color combination to find. 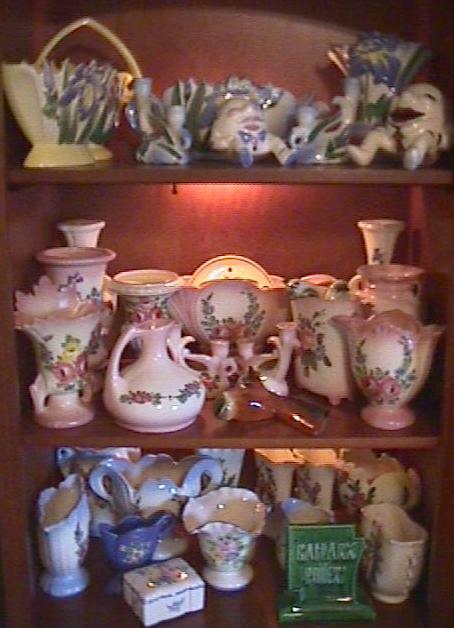 Michelle's Pig Bank haul from our Zanesville trip.